When I started my daily RunHaiku rhythm last fall, then continued it through the cold and dark early mornings of winter, I thought, if I could tune my senses to wonder and attention in the bleakness of winter, how amazing would spring be? As temperatures rose, I found myself obsessed with arrival of birds, leaves, and blossoms. The change was everywhere. Bare fields became head-high walls of corn. A collection of twigs and trunks became a lush forest bursting with flowers and berries. Spring is a bundle of miracles unraveling all at once. 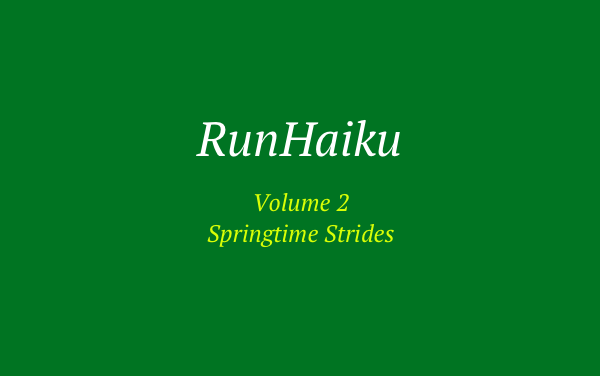 RunHaiku Volume 2 – Springtime Strides is now live! Check them out here. These poems represent my noticings over 80+ runs (and nearly 550 miles, you can see this whole thing is getting out of hand…) from Mar 23 – June 30. Oh, if you’d like to join the RunHaiku revolution (that’s right, a revolution 😉 ) submit your haiku here! I’m currently packaging up a collection of awesome submissions, and I’d love to include yours!